Beautify your yard & protect water resources with native plantings, raingardens, and shoreline plantings. Best of all, there are grants available to help you get started! 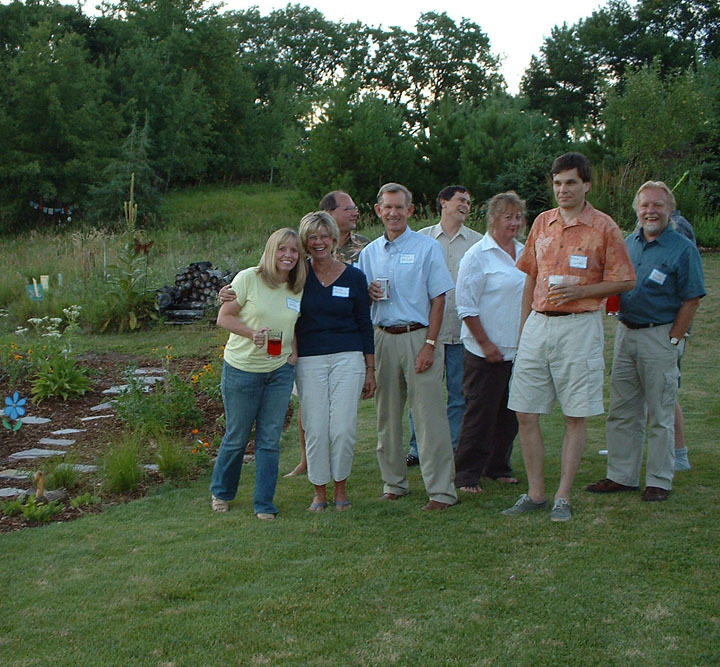 We'll connect you with local native plant nurseries and landscape designers, give you sample garden designs, and tell you about the grants available in your area. Visit the events page to learn about upcoming workshops and events. Have a few acres or more? Visit the Go Wild! page to learn about ways to improve wildlife habitat on your land and protect rivers, lakes and streams. Neighbors pose for a quick photo during a Blue Thumb Neighborhood Party. Are you looking for an excuse to eat, drink and be merry? Invite your friends and neighbors to your home for a Garden Party or request a presentation for your church, garden club or citizen group. Learn how to create beautiful gardens for your home that complement and enhance your existing landscaping, attract birds and butterflies and help to keep local lakes and rivers clean. Get in touch with grants, garden blue-prints, local nurseries and landscape companies, how-to guides, workshops and more! Contact Angie Hong for more information. Are you a homeowner thinking about doing a conservation project? In addition to a site visit, you can check out the Homeowner Resource Packet to get you started. FREE SITE VISITS FOR WASHINGTON COUNTY: SIGN UP here OR CALL US AT 651-330-8220. Have a hard time keeping up with Garden maintenance? sign up for our calendar that will send you monthly reminders to keep your raingarden or native planting in the best shape possible! No one likes to swim in a green, algae covered lake or fish from a smelly river. We all rely on clean water here in Washington County for drinking, fishing, swimming and recreation and it's up to all of us to keep our water clean and usable. Did you know that stormwater runoff is the number one cause of water pollution here in Washington County? Every time it rains, water runs off of roofs, driveways and roads and into storm sewers and roadside ditches. Along the way, stormwater runoff picks up dirt, fertilizer, oil and other pollutants, which are then carried to local lakes and rivers. The result is dirty water and lots of thick green algae. You can check out the report card for your local lake, learn more about the groundwater we drink or find out how we can control stormwater pollution.